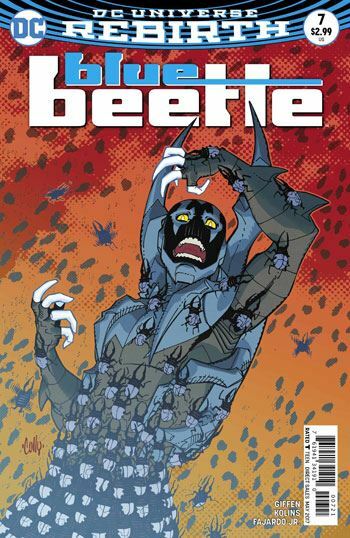 The main villain in this first storyline for Blue Beetle gets revealed in issue 7. If you think I am going to tell you who it is, you are sadly mistaken. It is a strong issue, though, and the revelation is satisfying, if surprising. This is another heavy battle issue, and makes the most of Dr. Fate’s role in the story. We also get to see that it is, once more, Kent Nelson beneath the golden helm. While I have always loved the original, Kent Nelson, version of Dr. Fate I had grown fond of the more recent one, Khalid Nassour. The unusual mantle that this Fate wears over his chest had indicated that it was not Khalid. Well, that and the fact that the Dr. Fate appearing in this book was clearly not a newbie in the role. So if we are going to have an old pro as Dr. Fate, it’s better that it’s Kent Nelson, rather than anyone else. Giffen is just so darn good at writing Dr. Fate’s dialogue. He makes the most arcane speech feel natural from the Lord of Order. More development is given to Jaime Reyes’ family and friends, and Ted Kord sees a bit of action as well. 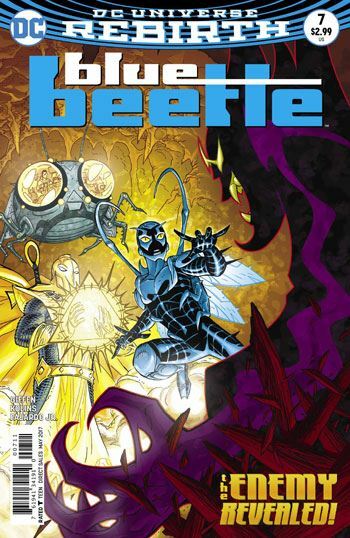 Credit has to be given to Giffen and Kolins for coming up with another origin/explanation for the Blue Beetle scarab. There have been so many in recent years, one would expect the well to be running dry. I also really enjoy Kolins art on this issue. The fight between Dr. Fate and Blue Beetle looks great, but the scenes dealing with everyday people in normal locations are also visually quite strong.